JAG Art Classes are up and running, with a range of inner city and workshop staff participating in the creation of amateur, but inspired art projects. This weeks themes included Bafana Bafana memories and aspirations, and self-portraits using recycled materials. As two aspiring, but rather untalented artists, Ellen and I decided to take advantage of the free art classes at JAG. Run by Nolan Stevens and Nkateko Manganye), the classes are designed to offer an introduction to Art theory and practice to people with little or no formal art training. Located in the Johannesburg Art Gallery, the space is seeped in inspiration and learning abounds. Our fellow class mates included 10 other inner city dwellers, aged 10 – 35, of varying talent and aspiration. The class started with a session about the use of line and colour to create mood in visual art works. Using comic books, graphic novels and CD covers, Nolan led a lively discussion about how to capitalize on formal art techniques when creating an image. Last weeks participants then presented the first page of their graphic novels, which they had completed for homework. 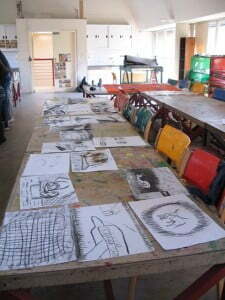 Our creative session involved a series of 2010 inspired charcoal drawings, and then a really interesting project creating self portraits / body maps using the strips of paper donated from the Print Workshop recycling bin. Nkateko showed everyone how to weave the strips together, and Nolan and Nkateko took us through a series of different kinds of unconventional self portraits, including text pieces. We then had to develop our own concepts and make a demo piece, which was shared with the class and we had a hearty discussion about how to ‘push the envelope’ with our designs and constructions. The class was highly educational and enjoyable. Julia Cloete – Apprentice Printmaker.